종묘는 조선왕조 역대 임금의 신위를 모신 곳으로, 정전은 종묘의 중심 건물로 영녕전과 구분하여 태묘(太廟)라 부르기도 한다. 정전은 조선시대 초 태조 이성계의 4대조(목조, 익조, 도조, 환조) 신위를 모셨으나, 그 후 당시 재위하던 왕의 4대조(고조, 증조, 조부, 부)와 조선시대 역대 왕 가운데 공덕이 있는 왕과 왕비의 신주를 모시고 제사하는 곳이 되었다. 종묘는 토지와 곡식의 신에게 제사지내는 사직단과 함께 국가에서 가장 중요시한 제례 공간으로, 그 건축 양식은 최고의 격식을 갖춘다. 현재 정전에는 서쪽 제1실에서부터 19분 왕과 왕비의 신주를 각 칸을 1실로 하여 모두 19개의 방에 모시고 있다. 이 건물은 칸마다 아무런 장식을 하지 않은 매우 단순한 구조이지만, 19칸이 옆으로 길게 이어져 우리나라 단일건물로는 가장 긴 건물이다. 홑처마에 지붕은 사람 인(人)자 모양의 맞배지붕 건물이며, 기둥은 가운데 부분이 볼록한 배흘림 형태의 둥근 기둥이고, 정남쪽에 3칸의 정문이 있다. 종묘 정전은 선왕에게 제사지내는 최고의 격식과 검소함을 건축공간으로 구현한, 조선시대 건축가들의 뛰어난 공간창조 예술성을 찾아볼 수 있는 건물이다. 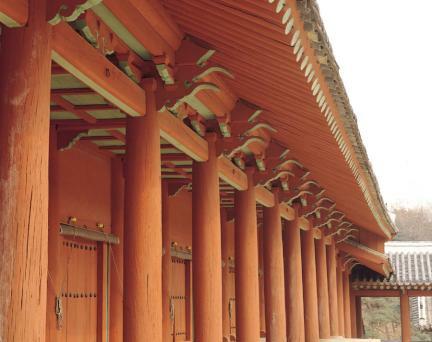 Jongmyo is the place to retain the successive kings' tablet. 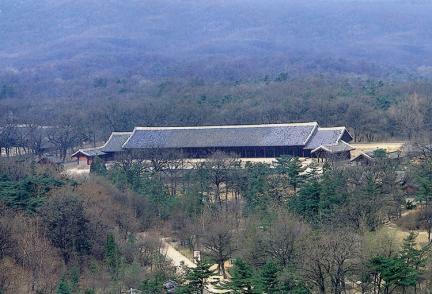 Jeongjeon is the central building of Jongmyo. 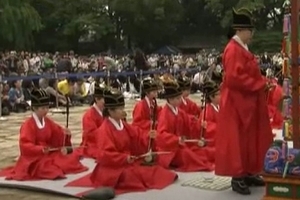 It is now preserves only the kins with meritorious deeds in the Joseon Dynasty. 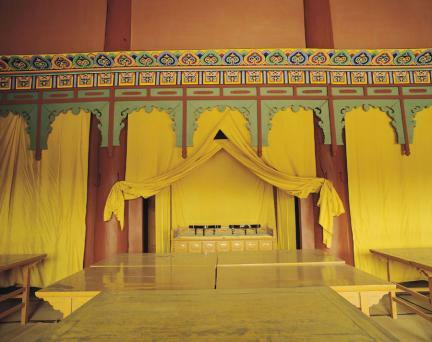 It is the place where memorial services were performed for those deceased kings. 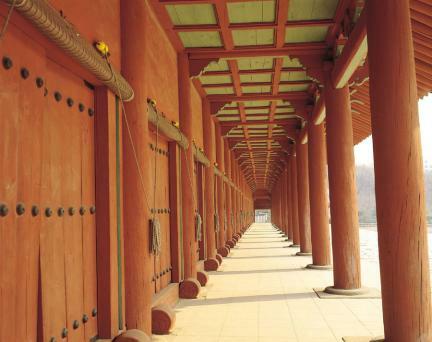 Jongmyo, along with the rituals where services for the Gods of Earth and Crops were performed, was considered as the most important ritual, and the most significant for the architecture in Korea. 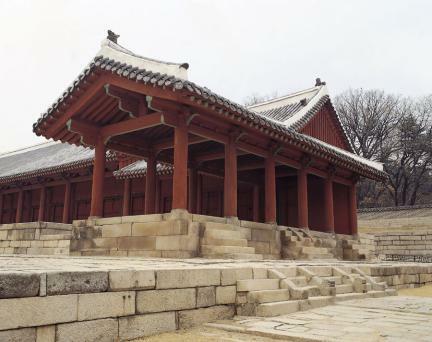 There were a total of 19 rooms and each room was used for the memorial tablet of King Taejo, his queen, followed by the room for King Taejong and his queen. 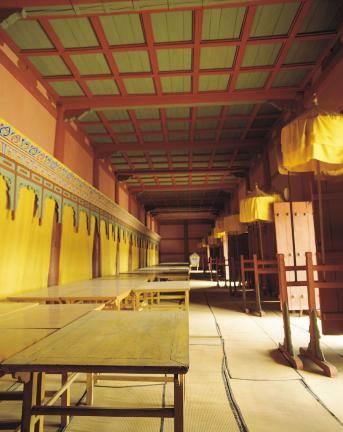 The rooms following were in the order that ended with King Sunjong, the last king of Joseon, and his queen. 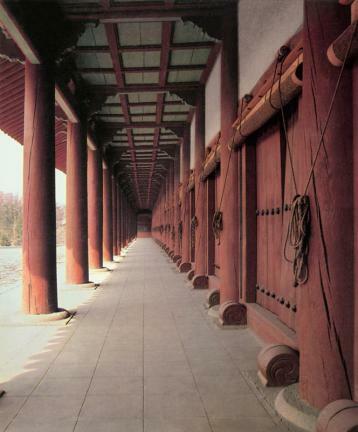 Although the rooms were extremely simple structures without ornamentation, the Jeongjeon which was comprised of 19 identical rooms side by side, was the longest single building in Korea. 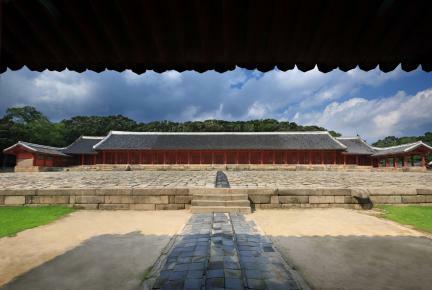 Jongmyo, the place where memorial services were performed for the kings, represented the splendid art of the Joseon Dynasty and could be seen as the highest formality and magnificent skill of the architecture that created the arts of space in the Joseon Dynasty.